New faces of Western Balkans politics: continuity or change? CEP Project Manager Sabina Carli moderated a discussion “New faces of Western Balkans politics: continuity or change?” in the framework of the 2018 edition of Balkan SAYS – Security Architecture Youth Seminar in Ljubljana, Slovenia in the beginning of October. 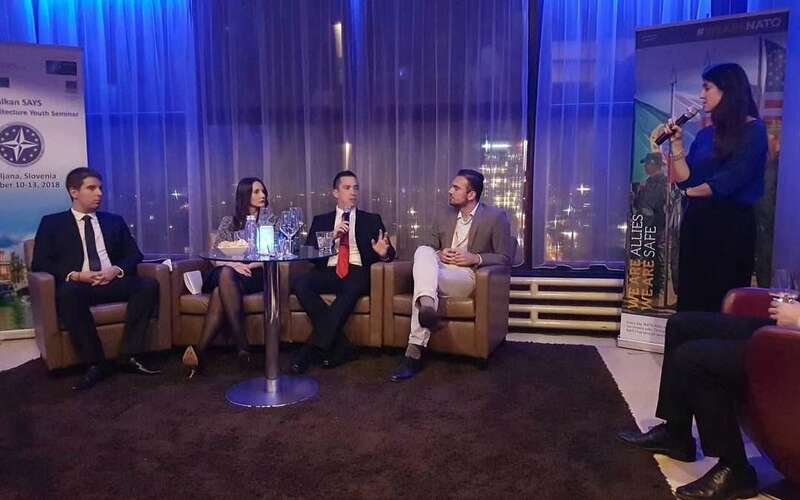 A night-owl session, focusing on the young leaders for reform, development and growth hosted Mr Daniel Fazlić, Pro Plus; Mr Luka Nikolić, Centre for International Public Policy; Ms Ivana Martac, Balkan SAYS Participant; and Mr Emir Hasanović, Ministry of Defense of the Republic of Macedonia. An inclusive format of discussion delved into the challenges of persistent economic weakness, corruption, high (youth) unemployment, brain drain, combined with growing public frustration with politics and politicians, and renewed nationalist rhetoric. The fact is that the issues will have to be addressed by current and future leaders of the Western Balkan countries. Therefore, the people chosen to be in the position to address these problems will need to possess the necessary qualities to effectively deal with them, via experience or simply via a new perspective. The question of old or new faces is one that sees prominence through much of the world, and it is no different in the Western Balkan region. Some prefer to put their trust into the faces they know, whilst some would look to entrust this process to new faces who, while less experienced, do not come with the baggage of the past, and who could potentially provide a new outlook or vision for their country. The panel identified crucial pending reforms but also looked at the bright sides and successes from the past and present. Among the most prominent ideas of the discussion were participation and engagement of young people in decision-making processes, in democratic processes and in grass-root organizations. Euro-Atlantic Council of Slovenia, the organizer of the Balkan SAYS seminar, has been an important partner of this years Young Bled Strategic Forum and the Centre for European Perspective.